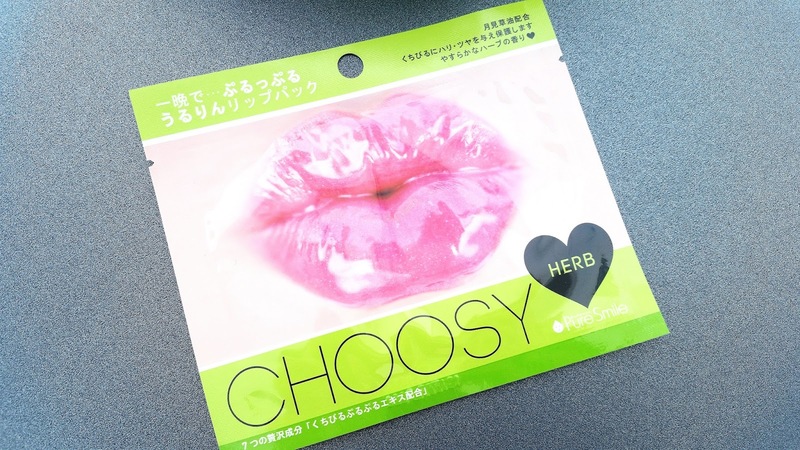 Continuing on with our Choosy Lip Mask adventures, this time it's all about the Herb Lip Pack. Choosy Lip Pack in Herb is part of the Original line of lip masks from Pure Smile. There's also the Pearl line and not too long ago they also came out with the Art Lip line. I have all the Original and Pearl lip masks, some of which I've already reviewed and the rest will be reviewed by the end of the year (hopefully). I'm thinking about getting some of the Art Lip masks to try as well but I think I should wait until I'm almost finished with my current lip masks and then order them with my repurchases. Anyways, let's get to know this Herb Lip Pack! 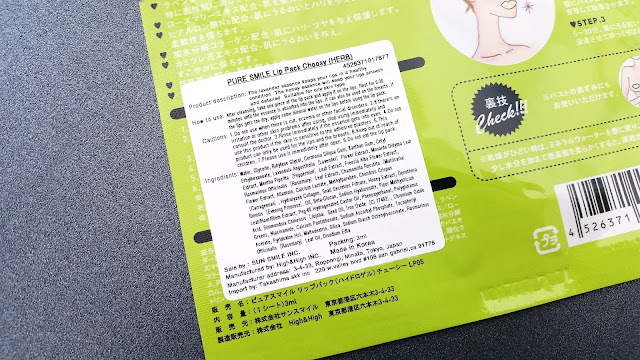 Product Description: Pure Smile Choosy Lip Pack in Herb is a hydro gel lip mask. It's moisturizing and softening. Plus, it's formulated with a ton of herbal and botanical extracts such as rosemary extract, lavender extract, peppermint extract, and more. To Use: Cleanse your lips and hands. Remove the mask from its package and apply it onto the lips. Leave the mask on for 5 to 30 minutes (can be left on for longer), then remove and massage any remaining essence on the lips. Tip: the lip masks are more effective when used after a bath/shower. Ingredients: Water, glycerin, butylene glycol, ceratonia siliqua gum, xanthan gum, lavandula angustifolia (lavender) flower extract, monarda didyma leaf extract, mentha piperita (peppermint) leaf extract, fressia alba flower extract, rosmarinus officinalis (rosemary) leaf extract, chamomilla recutita (matricaria) flower extract, hydrolyzed collagen, snail secretion filtrate, honey extract, niacinamide, calcium pantothenate, sodium ascorbyl phosphate, tocopheryl acetate, pyidoxine HCI, maltodextrin, sodium starch, silica, oenothera biennis (evening primrose) oil, beta-glucan, sodium hyaluronate, chondrus crispus (carrageenan), piper methysticum leaf/root/stem extract, allantoin, calcium lactate, polyglutamic acid, simmondsia chinensis (jojoba) seed oil, PEG-60 hydrgenated castor oil, rosmarinus officinalis (rosemary) leaf oil, methylparaben, phenoxyethanol, disodium EDTA, iron oxide (Cl 77492), chromium oxide greens. I've highlighted some ingredients above. All of the Choosy lip masks contain the same basic ingredients used to make the hydro gel lip masks. However, those highlighted are the ingredients that are special to this lip mask only. I've done this with all of my previous Choosy Lip Pack reviews as well, so it gives you an idea of what's different between each mask. Packaging: The Pure Smile Choosy Lip Pack in Herb has the same packaging style as the other lip masks from the same line. With the exception that it's main color is lime green. The white sticker on the back looks a little different too but the information is pretty much the same. The reason as to why the white sticker with English information looks different is because they, the English stickers, are made by different distribution companies. Scent: I was expecting some sort of herb scent from this mask, however, there was none. Instead, it just has that typical hydro gel scent and nothing else. Color: The lip mask is pale yellow-green in color. It's super opaque as well. Texture: Like all other Choosy lip masks, the Herb lip mask also has a hydro gel texture. It's very flexible and adheres nicely to the lips. Michelle's Thoughts: This past week's lip care routine was like a rollercoaster, especially the lip mask part. I thought I was going to be in big trouble but in the end I was just left rather confused. You see, it started off as a normal lip care routine. I used my wash-off lip mask to remove any dead skin on my lips then moved onto the Choosy Lip mask in Herb. Now, this is where the rollercoaster began. 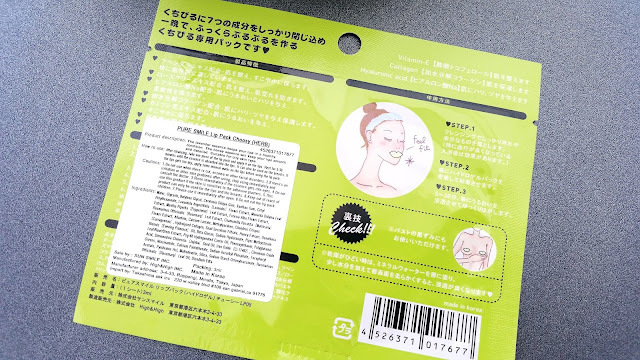 I knew from the ingredients list that this lip mask might cause tingly effects since it contains peppermint extract (which is known to cause potential tingly effects). However, I didn't expect just how tingly it would be. For me, the tingly effects started light but grew strong and stronger over time. It was to the point that I had to remove the mask at the 30 minutes mark and you guys know I generally leave my lip masks on for at least an hour. The tingly effect just became too unbearable for me. After I removed the lip mask, I touched my lips and I found the center of my bottom lip to be a little sore (it hurt when I touched it) and that wasn't the case before I applied the mask. So, I might have freaked out a bit. Luckily (sort of), that soreness went away after a few hours and my lips didn't look swollen or anything. It's been 2 days since I used the mask and my lip area still looks fine and I didn't experience any breakouts or other irritations. So, I'm guessing the worst is over. Before I used the lip mask I did double checked the ingredients special to this lip mask and to my knowledge none of them cause irritations for me. So this has left me with a little confusion. 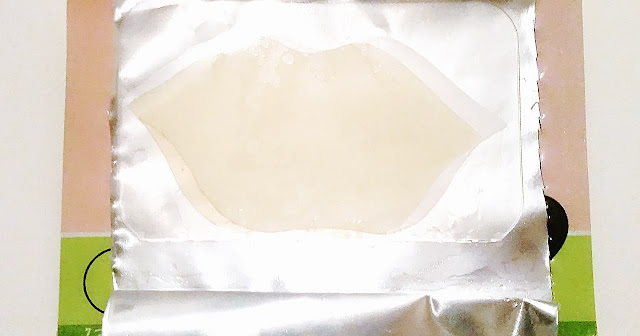 To add to the confusion, despite the tingly irritation and soreness the lip mask caused, somehow it still managed to hydrate, moisturize, and soften my lips. I know, what in the who how? It's like the lip mask did its job but decided to leave me an extra little surprise or something. Anyways, I tried to figure out what could have caused the soreness but I wasn't able to come up with anything. However, I'm just glad that's over and it didn't do any lasting damage. Final Thoughts: I don't think everyone is going to run into the same issues as I did. However, I do think it would be wise to double check the ingredients before you use this Herb lip mask. This lip mask might also cause tingly effects and possible soreness but again that'll depend on how sensitive your lips are. Despite all the troubles it caused me, I was surprised that it still managed to moisturize, soften, and hydrate my lips as well. I guess there was still some good in it. Would I repurchase it in the future? Well, you can probably tell from my experience that this lip mask is going on the no-no list. I do not want to go through that again even if it wasn't that bad. Do I think this is worth a try? Eh, maybe proceed with caution? I really don't think everyone will have the same issues as I did with this lip mask. Heck, your lips might even love this. However, if your lips are sensitive, you might want to be careful with this one. If anything buy one to try before buying a bulk of them. Or if you want to be safe, there are tons other Choosy Lip Packs to choose from as well.